The Jazz Studies instrumental curriculum provides a direct and pragmatic education for students interested in establishing a career in jazz and/or contemporary music. The goals of the program are to develop critical- thinking, problem-solving, literate, and highly skilled artists, entrepreneurs, and educators who will significantly affect their art form and society. Students receive weekly, one-hour private lessons in their major area with renowned artist teachers. Performance opportunities are plentiful in the School’s award-winning jazz, ethnic, and popular music ensembles. The core of this curriculum is spread over four years and includes theory and musicianship (foundational, jazz, and advanced), piano, improvisation, technology, and music business. Additional study topics include recording, acoustics, orchestration, arranging, and an array of music history and literature courses. Students can also select from courses in a wide variety of music, performing arts, visual arts, and business topics, and minors in music education, music business and technology, and other areas across the University. Ensemble and performance opportunities play a critical part in the student’s education by sharpening technical and improvisation skills and increasing the student’s command of repertoire and styles. 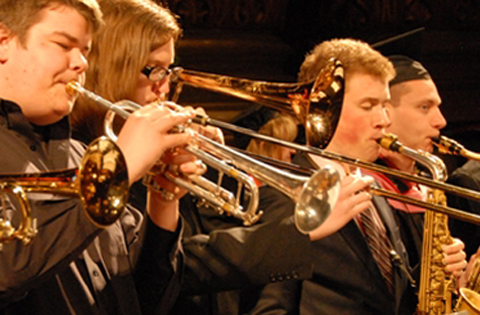 The School’s numerous performance ensembles represent a wide range of styles and categories of jazz, American, classical, contemporary, ethnic, and world music. Students are involved in a rigorous schedule of performances, with over 150 concerts and recitals presented each year. Woodwind majors may elect to enroll in a woodwind specialist program that includes the study of various woodwind instruments. demonstrate knowledge of current technological applications to assist in the creation of one’s art. 1Class piano is not required for students concentrating in piano. Instead, substitute three credits of electives. Complete 21 credits of free electives. This requirement is satisfied by any undergraduate course that isn’t required by the program.